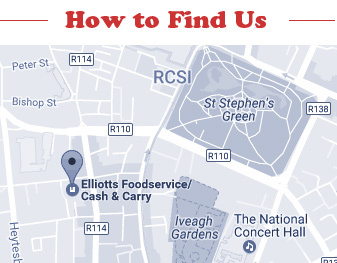 Elliott’s history begins in the early 20th century as meat/bacon curers and distributors of Mogerley sausages just off Cork Street in the heartland of Dublin. Founded by George Elliott, the business moved to a large site on its present location off Camden Street on Camden Row in 1961. It was an obvious decision to add food products and Elliott’s business took off. George Elliott’s sons Niall, Brian and Maurice followed him into the fledgling company and have been succeeded in turn by their children. A catastrophic fire in 1987 resulted in the rebuilding of the premises and the modern Cash and Carry Warehouse with car park, which was an investment that has paid off. Our delivery fleet allows us to service our many customers quickly, often the same day. Elliott’s became part of Stonehouse Group which is now Ireland’s leading independent wholesale company with a network of 24 member companies: all family run businesses totalling 30 warehouses nationwide. Being part of this group gives us better buying power which in turn means we can pass on lower prices onto our customers. Change was inevitable, as anyone in business knows, the only way to stay ahead of the game was to evolve. So why should we change something you’ve known for years? Elliott’s believed rebranding wasn’t just a facelift. It’s was a chance to seize new opportunities and stay ahead, stand out from the competition by introducing their new services, address new audiences and enter into new markets. “It’s was like a fresh start for us”. Elliott’s have been established in the cash & carry trade since 1961 and in 2014 thought it was time to refresh our look and show both our current customers and any potentially new customers what Elliott’s have to offer with our exceptional customer service, friendly staff, excellent value, great location and prompt free next day delivery service. For a successful business like Elliott’s rebranding wasn’t as a last resort, it’s was a strategic tool for advancement in the market. We seen this a chance to let people know that we are more than just a cash & carry and that we also have a foodservice side to our business. As a family run and managed business we bring that personal; touch to our customers and what we promise, we make sure we deliver on. 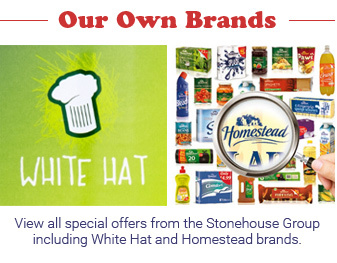 Elliott’s scooped the Stonehouse award for Best Sales & Support for the White Hat Brand nationwide. Exciting times ahead for Elliott’s Foodservice/Cash &Carry as we upgrade our existing website making it more user friendly with the option to order Online in the future. We are also upgrading our existing building by adding a mezzanine floor which will free up more floor space which will enable us to add new products to our range to move with our ever changing customers/markets needs. The new layout of the store will make it easier to shop, while giving a new lease of life to the Cash&Carry. With the next generation of the Elliott’s family already in the business with new ideas on how to bring the business forward we will continue to exceed the expectation of all our customer and potential customer’s way into the future.